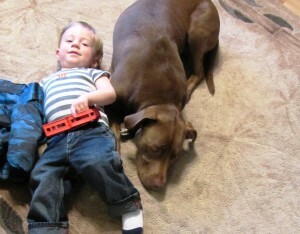 From the time my grandson was old enough to crawl, he and Kaia formed a deep bond. She loves the connection they share as he gently clamors over her. 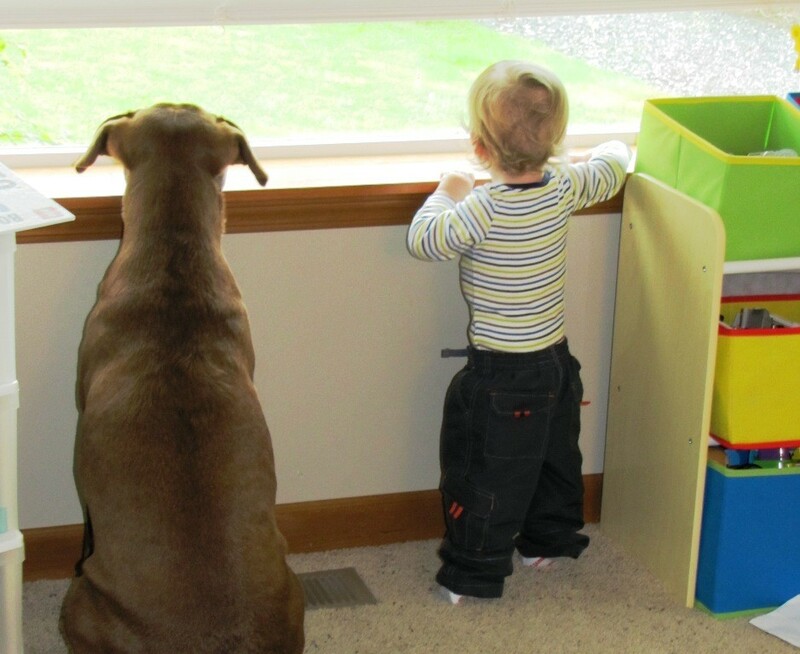 Kaia has played mother to her ‘pup’ ever since she was no longer the baby of the family. 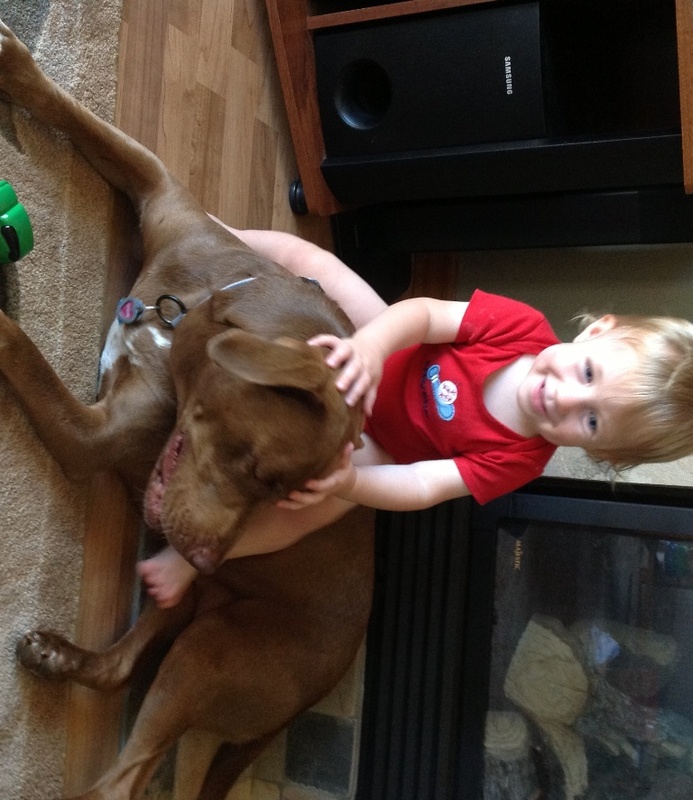 I found Kaia on Petfinder.com a few months after our long-time pet dog Roscoe passed away. Our house felt empty without a dog in it. Kaia was a 4 month old rescue puppy from Eastern Washington. She is a sweet chocolate lab/pit bull/weimeraner mix. I was pregnant with our second child the same month we adopted Kaia. She went from being the “baby” of the family to a surrogate “nanny” of our young son, guarding the baby swing while he slept and looking at me pointedly when he cried. Now our youngest is almost 2. He and Kaia love one another. He climbs on her, hugs her, and affectionately tugs on her ears and tail. They play chase when he holds a cracker and she chases him around the house. She still licks him like he’s her puppy. 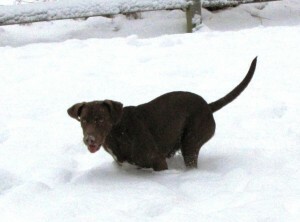 Dogs, like children, are fascinated by their first experience with snow. Our older son is almost 8. He is Kaia’s favorite playmate. She loves chasing and running with him. It was devastating when we took Kaia to the vet and learned she has a partially torn ACL. Unless she has surgery to repair it, her running days are over. That is sad because there is nothing that Kaia loves more than to run! She would still fetch balls and sticks with my boys if she could run. Our vet told us her operation would cost over $3,000. We want to do everything in the world to keep our young dog happy and healthy, but money is tight right now. No matter where the baby goes, Kaia is sure to be close by. Note: Anyone who has knowledge of canine care as it pertains to this pet’s torn ACL is invited to share their expertise in the comment section. Thank you for any support, financial or otherwise.